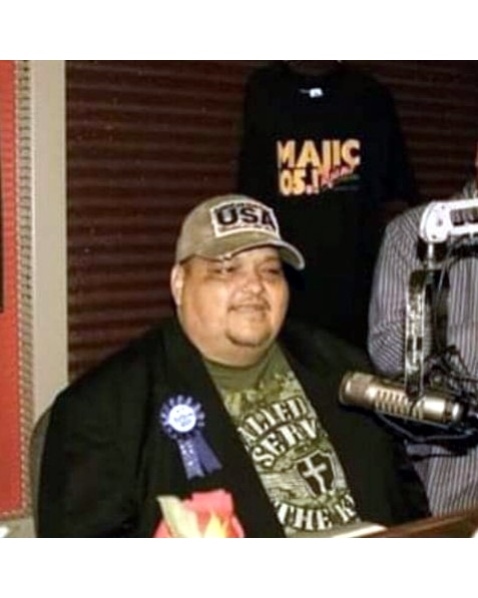 Timothy Trevino “Sugar Bear”, age 54, passed away on February 5, 2019. He was born on July 23, 1964 to Jose G. Trevino and Maria Luevano. He graduated from Ray H.S. in 1983. Tim was employed by Magic 105.1 for many years. He made his debut in radio in 1989 and immediately had a powerful impact as a top DJ. Later he went on to succeed at Magic 95.9 FM in Victoria. Sugar Bear was well loved by his many fans as well as Tejano Artists. Timothy was also an active member at St. Joseph and Sacred Heart Catholic Church. He will always be remembered for his giving heart, personality, radio talent, and determination. Timothy is the youngest of 14 children. He is preceded in death by Rene M. Trevino, Ruben A. Trevino, John Salyer Sr., Arturo H. Trevino and parents. Timothy is survived by 6 sisters and 3 brothers; Andrea (Jesus) Amaro, Tommi (Chris) Lyle, Bea (Ross) Paniagua, Mary (Dan) Ximenez, RoseAnn Trevino, Angie (Joe H.) Mondragon, Fred Salyer, George (Yolanda) Salyer, and Joe (Tinky) Trevino. Visitation will be held from 5:00 pm to 9:00 pm on Friday, February 15, 2019 at Corpus Christi Funeral Home with a Rosary to be recited at 7:00 p.m. that same evening. A Funeral Mass will be celebrated at 10:00 am Saturday, February 16, 2019 at Sacred Heart Catholic Church. In lieu of flowers donation may be made to Corpus Christi Funeral Home. God Bless you, Brother! Rest in Peace.